We can have some great weather in Nottingham majority of the time and when the warmth and sunshine comes it's really time to head out to the great outdoors. What better way to spend a balmy summer evening or Saturday afternoon than with a picnic? You might want to impress a partner or potential partner with a romantic picnic. Or take the kids out for an active picnic- there's an option for you locally in Nottinghamshire mentioned below. In every city there are often many green places that serve as an oasis away from the hustle and bustle of a city centre. Nottingham has a number of great places to escape the city while still being within it. Situated on the tram route north out of the city centre is The Arboretum. If you take the tram disembark at the High School Tram Stop and walk downhill for 150 meters- The Arboretum will be on your left hand side. The Arboretum is a green flag award winning park which has it's own small lake and aviary The Arboretum dates back to 1852 and is a popular site for Nottingham students to catch some sunshine on hot summers day's. A map of the Arboretum can be found here. Be aware that the tram travels up Waverley Street when you look at the map of The Arboretum. The arboretum has it's own wooded area for some shade on a hot summers day and it's well kept by an excellent team of gardeners which makes you proud to be from Nottingham. If you're coming to Nottingham as a tourist you cannot leave without a visit to the famous Nottingham Castle. The grounds are a fantastic opportunity for an urban picnic whether you bring something from home or pick up a sandwich to enjoy on your way through Nottingham. Nottingham Castle offers a great vantage point to look over the southern side of the city due to it's elevated position. It also features a museum and art gallery to make the most of your visit. Despite being close to the centre of Nottingham, Wollaton Hall is a fantastic destination for a picnic. It's very popular with local Nottingham University students Wollaton Hall is a Nottingham picnic institution. A large country park and lake allows plenty of opportunities to wander, take in the fantastic gardens and find a quiet spot if that's what you're looking for- you might even be able to spot some of the local Deer. The Hall itself can be a little bit of a let down so it's best to stay outdoors while at Wollaton Hall for a picnic. Situated almost equidistantly between Nottingham and Mansfield just off the main A60 road is Burntstump Country Park. On the site of the country park is The Burntstump- a public house where the adults can grab a cold beer or wine to relax while the children play. Burntstump has lots of options for an active picnic. A large wooded area for hide and seek style games, cricket on the wicket (pictured) football and there's also a playground area too. Excuse the sign- Burntstump Country Park is a great place for family picnics, games and a cold beer from The Burntstump Pub in the distance. 5. Sherwood Pines Forest Park- great for cycling and picnics. Sherwood Pines is pretty much the best place in Nottinghamshire for cycling and an active family. With the high ropes course of Go Ape on site as well as a huge selection of walking and cycling trails you can easily spend a whole day up at Sherwood Pines whether it's you and a partner, or the whole family. Sherwood Pines is easy to get to, has lots of parking (although you do have to pay), on site bike hire from Sherwood Pines Cycles is available if you don't have bikes for the whole family too to help you work up an appetite for a picnic or even bringing your own barbecue. If you're feeling lazy too after a tiring morning of cycling there is also a very nice cafe serving a selection of sweet and savoury treats in case you don't fancy a picnic or simply want something extra. Where are the most romantic places in Nottingham and Nottinghamshire for a picnic? Obviously it depends on what you class as romance and romantic so the below options address various scenarios. 6. 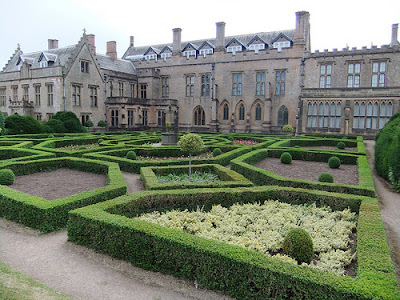 Romantic places for a picnic in Nottinghamshire for historians and poets- Newstead Abbey. 7. Romance and nature in Nottinghamshire. A picnic in Sherwood Forest, Robin Hood country. Why not have a picnic in your own back garden- it'll be a quick sprint inside when the heavens open! If you're looking for a baking idea for your picnic why not consider these Sesame and Linseed Biscuits? Do you have any suggestions we might have left off? You should always consult with the parks owner / manager or parks department before you even consider going for a BBQ in a public place, its mostly the nuisance aspect and the safety aspect as well as damage to the grass it causes which is the reaon that BBQ's are not allowed in public places.